What makes a great digital experience? Limelight has been asking that question to consumers for the past 3 years and the findings may surprise you! • How Millennials differ in their behaviors and expectations around digital experiences. 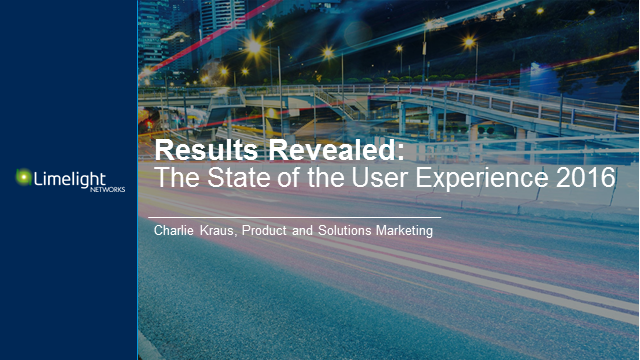 The 2016 State of the User Experience Report is based upon the survey responses of more than 1,600 US consumers ranging in demographics, gender, education, and spend more than five hours a week online outside of work. All webinar attendees will receive a full report of our findings. Discover a hidden gem for your digital content delivery. If you’re using or considering a Content Delivery Network (CDN), you’ve probably heard of origin storage. But you may not know much about it. Done right, CDN origin storage doesn’t take a lot of your team’s time, dramatically improves user experience, and can even save you money. Done wrong, it can waste valuable resources, time, effort and money, only to deliver bad user experience -- and you might not even know it. Then we’ll open up the floor to an “Ask the Expert” session with Solutions Engineer Kyle Carpenter. Register now for this informative session and submit questions for Kyle! Whether you’re delivering online video, files, websites, gaming or e-commerce, this webinar can provide valuable perspective and opportunities for improvement. Then we’ll open up the floor to an “Ask the Expert” session with Solutions Engineer Kerrion Burton Evans. Register now for this informative session and submit questions for Kerrion! Online retailing is no longer as simple as duplicating the in-store experience. It is about so much more. Online retailers are expected to deliver fast, personalized shopping experiences featuring rich media and video, to customers on any device, wherever and whenever they choose. These realities have introduced a host of challenges for retailers, but they also offer significant opportunities to improve customer conversion and retention. What does this mean for retailers trying to deliver exceptional online experiences that maximize revenue and build customer loyalty? Join us as we review the technical challenges that impact your ability to deliver exceptional e-tail customer experiences, and strategies for overcoming them. · How best to safeguard your website against malicious attacks. Since 2015, Limelight has surveyed thousands of consumers about their online video viewing habits and expectations, but findings from our latest report reveal some interesting changes. Bottom line – the consumer has taken control of the online video experience. They not only want, but also expect, to be able to choose what they watch and when they watch it. What does this mean for broadcasters and content distributors trying to satisfy consumer demand while also maximizing revenue? Join us for this free webinar on Tuesday, January 31st as our video delivery experts share recent findings from the latest State of Online Video report. We will discuss strategies organizations can implement in 2017 to deliver compelling online video experiences to their audiences that will keep them coming back for more. · Tips for optimizing the online video viewing experience. All webinar attendees will receive the complete December 2016 State of Online Video report. In the last few months we have seen cyber attacks on corporations as diverse as Deutsche Telekom and Tesco. From the boardroom to the backroom there is an increasing awareness of complex cyber-security attacks. Businesses need a proactive solution that not only protects digital content and properties but also keeps one step ahead of these evolving threats. Join us on 18th January for a live webinar with Limelight's digital security experts, who will share specific use cases to illustrate key strategies and best practices for a cloud-based security solution. Today’s businesses need a proactive cyber-security solution that not only protects digital content and properties but also keeps up with evolving cyber threats. With the complexity of responding to security breaches on the rise, you need a solution that doesn’t impact your audience’s quality of experience. In this interactive webinar, Limelight’s digital security experts provide an overview of the current threat landscape with use cases, and outline strategies for implementing a cloud-based security solution that scales to meet the unique needs of each use case. •Controlled access by enforcing content licensing restrictions with Geo-fencing, URL tokenization, IP address whitelisting and blacklisting. When you register, enter a question you would like to see addressed during the webinar. As organizations compete for the same consumers, many companies are turning to live-streaming video content to better engage their online audience. But to deliver the live streaming experience viewers expect, organizations need a technical plan that will support successful live-streaming to viewers around the globe on any device. Whether you are delivering live-streaming events now or are looking to add them to your existing VOD workflow, join us for this live webinar where our expert will outline key considerations for delivering live-streaming video to ensure the highest Quality of Experience for viewers. From the boardroom to the backroom, everyone is looking for ways to protect digital content from increasing cyber threats, DDoS attacks, unauthorized access or theft. But safeguarding your content isn’t a one-size-fits-all proposition - it requires a multi-layered defensive strategy to ensure a safe and superior quality of experience for your online audience. And best of all, we will leave plenty of time for you to ask your own questions too. Everyone who registers will receive a copy of our new whitepaper “10 Ways to Secure Your Digital Content” as a special bonus. When it comes to online video, Millennials are different. Not only do they consume more online video, but findings from our latest State of Online Video research report reveal definite differences in their behaviors and perceptions around online videos compared to other demographics. For organizations looking to engage Millennials with online video, understanding these behaviors and perceptions are critical. During this live webinar, Jason Thibeault, Senior Director of Content Marketing, will share key findings from this report and outline three things your business needs to know to get Millennials to watch your online videos. • How much buffering are Millennials willing to tolerate? • What will make advertising in online video palatable to Millennials? • What devices are Millennials using to consume online video? As a bonus, all attendees will receive the full State of Online Video Report. Et si le rêve de toute start-up dans le monde des nouvelles technologies devenait un jour réalité? C’est ce qui est arrivé à CoachGuitar, application de e-learning, qui a été élue Meilleure Application dans tous les Apple Stores, et qui, créée à Paris il y a seulement 3 ans, connue de San Francisco jusqu’en Chine, cumule aujourd’hui plus de 4 millions de téléchargement. Dans ce webinaire nous allons vous expliquer pourquoi nos 2 sociétés ont noué ce partenariat pour assurer aux élèves en ligne de CoachGuitar la meilleure expérience digitale. Delivering software or device updates to a global user base is complex, with high expectations on the part of customers for a smooth trouble free experience on every device, every time. To meet those expectations, optimization cannot be an afterthought for software and device manufacturers. This webinar will use real customer examples to illustrate how leading companies have built optimization into every stage of the file distribution workflow. We’ll take a close look at how a global security solutions company successfully publishes security updates to tens of millions of customers every 4 hours. The latest trends in using downloads and updates as branding reinforcement opportunities, file protection, and access control will also be shared. Will you be prepared to succeed in the face of these coming changes? Find out during this live webinar on June 10th when Principal Technical Evangelist, Jason Thibeault, shares the full results of Limelight Networks’ State of Online Video analysis, a 2015 global survey report examining the video consumption habits of over 1,200 consumers. This is an excellent opportunity to access the most up-to-date information on key trends shaping the future of online video. Then, using the results as our backdrop, we’ll take it one step further by examining what these trends really mean for video publishing and uncover the strategies that your organization must employ in order to be successful in the future of online video. Delivering a great game experience has become harder than ever. Join this webinar to learn how to identify all of the major elements you’ll need to build your own game distribution network and how those components map to the gaming lifecycle. PC and Massive Multi-Player Online (MMO) games will account for over 30% of the world’s $100Bn+ game revenues by 2017. Globalization, cross-screen gaming, video streaming, esports and running games-as-a-service are changing the gaming landscape at an enormous pace and provide opportunities for those who can deliver their games and media content at scale. Will you be prepared? Find out on May 14 when experts from games market research and analytics firm, Newzoo International, and Limelight Networks discuss the state of the PC/MMO market and critical success factors for game developers and publishers. Newzoo will share a sneak preview of their annual top 10 trends shaping the future of the games industry that will be part of their global report published in June. • Solutions for improving your patch, UGC, video content, expansions, and DLC distribution strategies"
Make sure you are ready to deliver in the ever-changing global games market. 2014 was a watershed year for cybersecurity as DDoS attacks reached a tipping point in terms of complexity, pace and scale. Today, operations and online performance are often already impacted before an attack is even detected, leaving organizations struggling to contain the damage while fighting to get ahead of persistent malicious traffic. Join security experts from Radware and Limelight Networks on May 6 as we take a closer look at the latest research on the global threat landscape, share real world experiences from Radware’s Emergency Response Team and offer proven defensive strategies. This is an excellent opportunity to learn what it takes to protect your organization against costly disruptions in the face of rapidly changing, increasingly sophisticated cyber-attacks. A live Q&A session will follow the presentation. Online digital engagement has become increasingly important but it has also become increasingly complex (e.g. richer content, number and diversity of devices, geographical dispersion, cyber threats). The question organizations now face is how to deliver rich digital content rapidly, reliably, securely and with high quality of experience (QoE) to global audiences anywhere, on any device? That is precisely the challenge that the Limelight Orchestrate Platform for digital content delivery seeks to address. V3.0 includes wide-ranging enhancements in the areas of security, video, storage and management and control – all of which go a long way in enabling better QoE on the digital frontier in which we now live. • Does personalization really matter? The State of the User Experience Report is based upon the survey responses of 1,115 US consumers ranging in demographics, gender, education, and spend more than five hours a week online outside of work. All webcast attendees will receive a full report of our findings. As the recently released Consumer Gaming Trends report makes very clear, the game experience is changing. It’s no longer just about a good storyline or how easy the game is to play. Gamers are becoming hypersensitive to other elements as the game experience expands and incorporates new content (video), bleeds into other platforms (multi-device), and is continually updated (Downloaded Content). • 5 things you must do to deliver the game experience that will keep your users playing…and paying. Bring your questions for the live Q&A session following the presentation! I+C Doosan Heavy Industries + Construction Co. Ltd., a subsidiary of Doosan Group, is one of the largest Korean heavy industrial companies.